The light, airy styling of this set is perfect for a relaxing time on your porch. 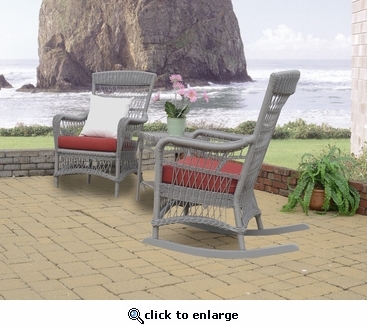 Handcrafted from the finest "All Weather" resin wicker, this set features woven polyresin vinyl over a sturdy powder-coated aluminum frame. Available in either Antique or Ocean Gray finish.